"Wake up to a hot breakfast!" Spray the crock of your slow cooker with cooking spray. Spread hash brown potatoes into the bottom of the crock. Heat a large skillet over medium-high heat. Cook and stir sausage in the hot skillet until browned and crumbly, 5 to 7 minutes; drain and discard grease. Spread sausage over the hash brown potatoes; top with Cheddar cheese. Beat eggs and milk together in a large bowl; add ground mustard and generously season with salt and pepper. 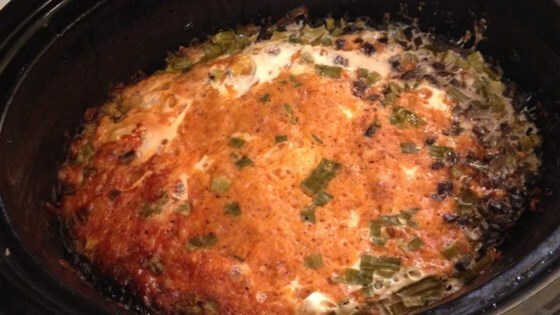 Mix seasonings thoroughly into the egg mixture; pour over the cheese layer in the slow cooker. I've used maple sausage, which is very good, too. If you sleep more than 6 to 8 hours and lack the discipline to get up just to turn off the slow cooker (like myself), feel free to make this the day before and keep it on warm all night. This recipe was good, but a bit dry. I agree that the cheese should be dispersed throughout the layers. I would also use about half of the hash brown potatoes.